Quality knives are every cook’s best friend. They make kitchen prep faster and, when used correctly, safer! When it comes to the knives in our kitchen, they are a valuable investment and are crucial to our food preparation and serving. An essential part of owning a good set of knives is their maintenance, which includes keeping them sharp. Rather than using a manual sharpener to hone your knife’s edge, save yourself some time and effort with an electric sharpener. These handy gadgets offer varied features – such as different sharpening angles – and not all work with all kinds of knives, for example serrated or ceramic knives. We take the guesswork out of your hunt by examining some of the best electric knife sharpeners to help you make the best decision for the longevity of your knives. This product has an advanced stropping – or polishing – stage and 100 percent diamond abrasives suitable for sharpening straight-edged knives and serrated knives. Note that it is not recommended for ceramic knives. It’s easy to use with flexible spring guides, automatic adjustment, and accurate control of the sharpening angle. This nifty gadget can handle the thickest or thinnest of knife blades and helps ensure those ultra-sharp edges. Stage 1: Diamond abrasives on the conical disks create fine ‘micro-grooves’ on both sides of the edge that give the knife more ‘bite’. Stage 2: This has even finer diamond abrasives on the conical disks that shape the second and smaller bevel of the edge, creating even finer micro-grooves at a slightly larger angle. Stage 3: This uses a patented, flexible abrasive stropping disk system to create a microscopically smooth, non-serrated, ultra-sharp edge by creating a third and still smaller bevel of the edge. This stropping action further polishes, creating an edge of incredible sharpness, performance and durability. It will also sharpen serrated knives. If you’re doing a first-time sharpen it takes about one minute to complete, while re-sharpening takes about 10 seconds. 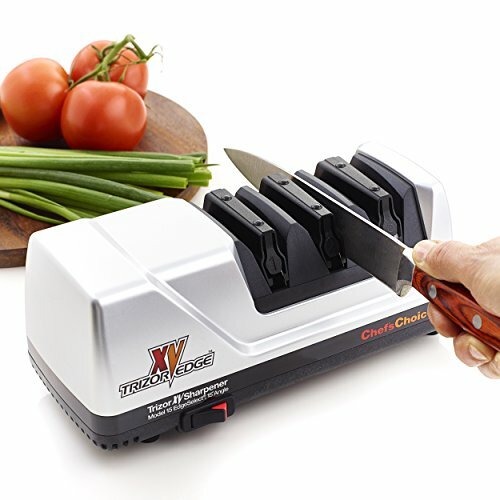 Impressively, it will also convert your knives from the traditional 20-degree factory edge that is typical of household knives, to the Trizor XV 15-degree edge that Chef’s Choice claim makes the knife easier to control and helps prolong its life. Although it is possible to use on hunting knives, note that too they will be converted to a 15-degree edge. The Work Sharp E3 comes with a two-speed electric sharpener and a separate ceramic honing rod. 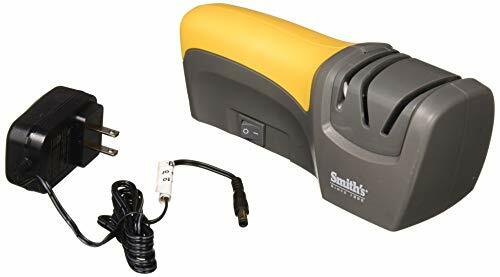 The electric sharpener has a two-speed motor: a high-speed setting for sharpening dull knives, and a slower setting for refining the edge after sharpening or for quick touch-ups. 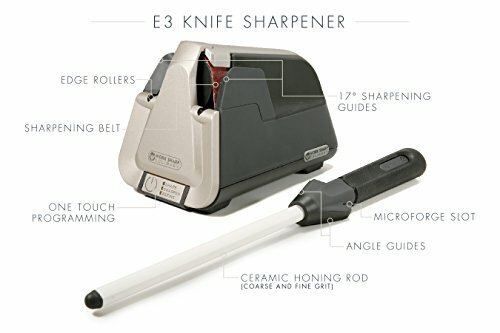 The E3 also has sharpening guides that will eliminate uneven sharpening and take the guesswork out of sharpening your knives – the know-how is built into the sharpener. According to Work Sharp, your knife will be sharp in 90 seconds or less, and you can’t damage your knives using this tool. The guides are leather lined, to gently hold your knives. Guides are set at a 17-degree angle that brings together the durability of Western knives with the precision of Eastern knives. The flexibility in the sharpening belts is the same technology used by professional services and manufacturers, and will preserve the quality and value of your kitchen cutlery. 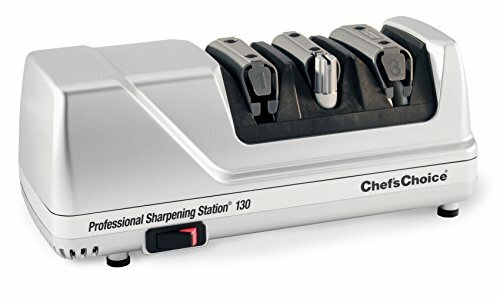 This product is unique because it includes a separate ceramic honing rod that can create ultra-sharp knives and touch up edges between sharpening. Honing can preserve the cutting effectiveness of knives and extend the time between sharpening. The Work Sharp E3 knife sharpener is versatile enough to sharpen every style of knife in your kitchen, including chef knives, paring knives, carving knives, serrated knives and more. It is not for sharpening ceramic knives. Wusthof is an internationally well-known knife brand that produces fine German-made kitchen knives. Wusthof has now partnered with Chef’s Choice to produce a Precision Edge Technology (PEtec) electric sharpener. This product will sharpen, hone and polish straight and serrated blades. Stage 1: A diamond abrasive wheel that creates a new edge on dull knife blades. Stage 2: Finer diamond grit wheel that will hone and refine the edge. Stage 3: Advanced stropping material that will polish the blade to a razor-sharp edge and will also sharpen serrated knives. This sharpener was not just made for Wusthof knives. It is compatible with all western-style knives to create the 14-degree edge of Wusthof knives. It is not for use on ceramic knives. 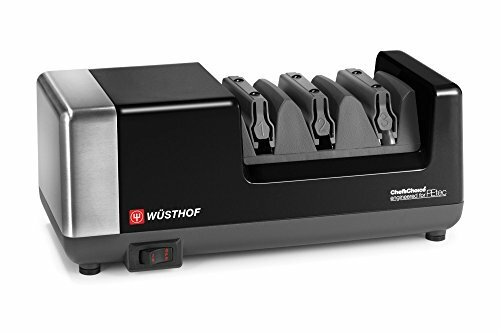 See our Wusthof knife sharpener reviews for more options. The Kyocera sharpener is unique in that it is battery powered. Unlike many featured here, it is also designed for ceramic and steel knives. Featuring an electric powered diamond grinding stone rated at #600 grade it can take up to 0.5 millimeters off a blade and achieve a 35-degree angle. The knife placement or guide slot is user-friendly and safe because it keeps the knife at a fixed angle. An assist roller keeps the pressure even and prevents over sharpening. There’s also a safety cover so the grinding and dust all stay contained within the cover. An indicator light lets you know the unit is on and working. The four AA batteries that it requires are not included. A great choice for chefs on the go – the battery power means you can use it in your RV and on extended camping trips in the great outdoors. While it is ideal for Kyocera ceramic knives, there are certain Kyocera products that it is not recommended for. Before you purchase it, be sure you don’t have the following knives: KT-075-HIP-D, KT-200-HIP-D, FK-125N WH, or BK FK-181 WH or BK. 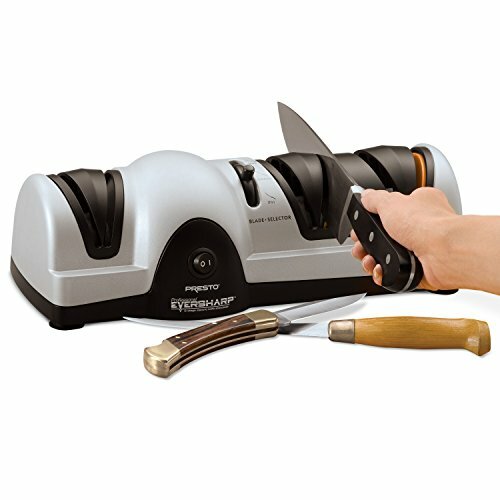 This Presto sharpener features a three-stage system that is designed for both kitchen and sport knives. The interchangeable blade guides give you optimum sharpening angles. There’s no guesswork with this sharpener – the blade guides automatically hold the knife at the ideal angle. To use, select thick for hunting knives, medium for chef’s knives or standard kitchen knives, and thin for light blades like fillet and paring knives. Draw the knife through each slot a few times to achieve a razor-sharp edge. Stage 1: This starts the sharpening process with a Sapphirite coarse grinding wheel that creates the proper angle. Stage 2: This continues sharpening with a Sapphirite medium grinding wheel to give the blade a precision edge. Stage 3: This completes the process with an extra-fine grit ceramic wheel that polishes the blade to an exact, razor-sharp edge. It is not recommended for use on ceramic knives. 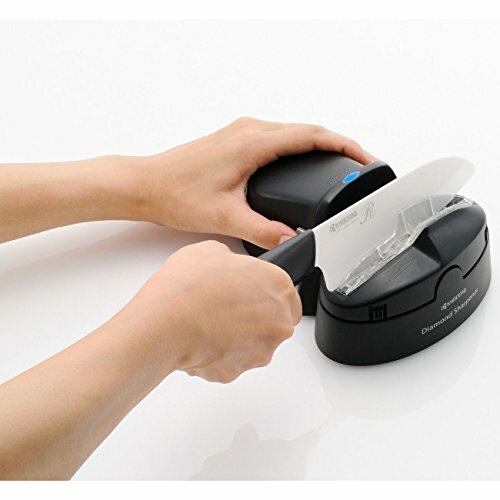 The LINKYO system is easy to use, with automatic blade positioning guides that hold the knife in the ideal angle. To use, simply draw the knife slowly towards you with no downward pressure. In fact, it has a built-in “stop” feature that stalls the sharpener if too much downward pressure is applied, helping prevent any damage to the blade. Stage 1: Reshapes the angle, sharpens and rejuvenates the edge. Stage 2: Finishes the sharpening process by honing and polishing the blade. It’s easy to clean up after using this product, featuring receptacles that catch metal shards and filings and easy-to-remove plugs to empty. 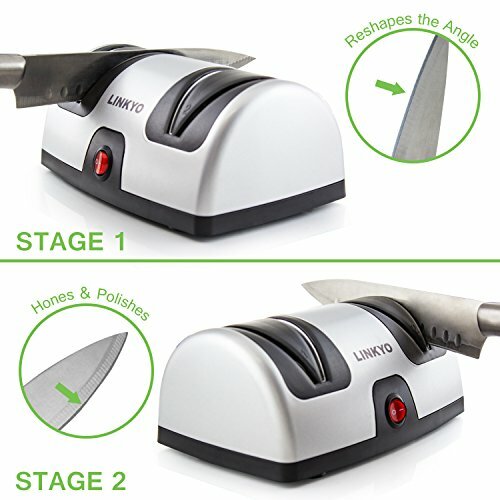 It also has handy non-slip suction cup feet that hold the sharpener firmly in place while you’re sharpening your knives. This product is not suitable for thick hunting knives or for ceramic knives. 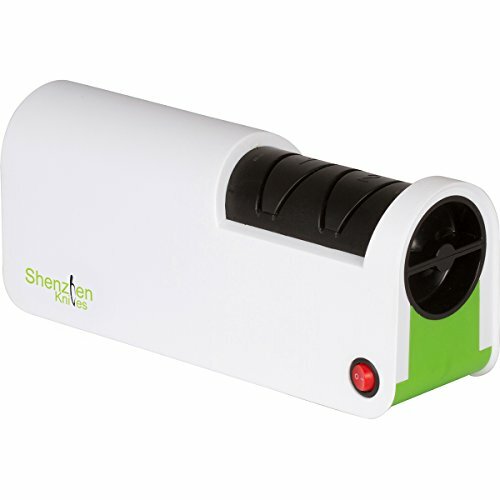 This sharpener is made by Shenzhen, a ceramic knife company, but it’s for use with both ceramic and stainless steel knives. It has a diamond grinding stone with two settings: a coarse setting with #600 grit and a fine setting with #800 grit. The coarse setting is 18-degrees and the fine setting is 20-degrees. The diamond grinding wheel can grind chips of up to 1mm off ceramic blades. It features a universal knife guide that keeps the knife at a fixed, traditional V angle. The slot accommodates most parts of a knife including the blade, heel, bolster and handle designs, allowing for tip-to-handle sharpening of ceramic kitchen knives. However, it is not suitable for serrated blades or hunting knives. Stage 1: For a blade that has rough edges or visible nicks. Lightly guide the knife through the slots on the coarse setting to sharpen it. Stage 2: To hone and polish the knife. Repeat this action using the slots for the fine setting for a smooth, sharp blade in seconds. It has a removable diamond wheel cartridge and cover that can also be replaced. The McGowan sharpener has a simple one-step precision sharpening process. Putting the knife into the slot activates fired ceramic stones that sharpen both sides of the blade simultaneously at the correct angle. That’s because the stones are on counter-rotating wheels. This creates a razor-sharp hollow ground edge. According to the manufacturer, it’s suitable for all kinds of knives, including electric, kitchen, serrated and cleavers. It isn’t clear if it’s suitable for ceramic knives. The McGowan is a bit unique in that it creates an edge with wheels that rotate upwards in the slot the knife is pulled through. Most rotate downwards. The grinding wheels are at the front of the slot, so you can sharpen almost any knife – including a pocket knife – because the sharpener doesn’t block the knife’s handle. 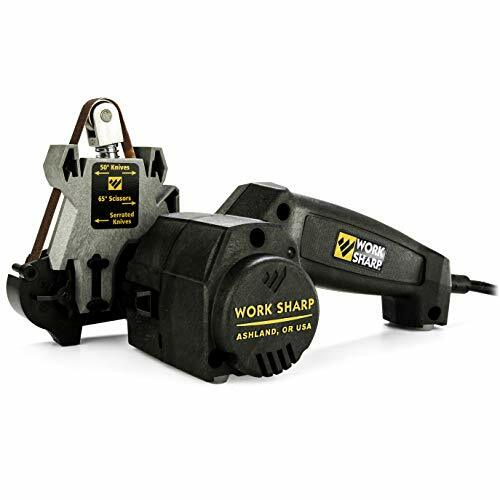 Combining manual and mechanical sharpening elements, this product has two components – a sharpening wheel and crossed ceramic rods. The sharpening wheels are made from bonded synthetics, designed to provide a longer wheel life, uniform cutting, and minimum heat build-up. The crossed ceramic rods put a final finished edge on the knife blade and create a pre-set sharpening angle that lightly hones both sides of the knife. To use the sharpener, first sharpen the knife in the sharpening wheels. The wheels sharpen one side of the blade at a time, and the blade guides hold the knife at the correct angle. You then use the ceramic rods for final edge honing by pulling the knife through the sharpening slot a few times. The crossed ceramic rods are also ideal for a quick touch-up of already sharpened knives. It isn’t suitable for serrated or ceramic knives, and can’t handle other items like scissors. This product is made by Chef’s Choice and has 100-percent diamond abrasives. It sharpens, steels, and strops most brands and types of knives. This is made for 20-degree class knives, and will sharpen both straight edge and serrated knives. Because it has diamond abrasives, it should be suitable for ceramic knives as well. Stage 1: Uses rotating conical disks with 100% diamond abrasives that sharpen the edge of your knife. Stage 2: This has a hardened miniature steel, and along with precision angle guides, it develops a shaving sharp edge with ultra-sharp microscopic serrations. Stage 2 can be used as often as you want to maintain a consistent razor-sharp edge until Stage 1 sharpening is necessary. Stage 3: Featuring a flexible abrasive disk system that is basically a high-tech version of the barber strop, it creates a microscopically smooth, ultra-sharp fine edge. It can be used as often as needed to keep edges polished and maintained until additional sharpening is needed. It is also for use on serrated knives. There are built-in precision angle guides in all three of the stages to eliminate guesswork and produce consistently sharp edges. This product bills itself as the all-in-one sharpener for everything in your home. It can handle many types of knives – kitchen, hunting, filet, outdoor, tactical, and pocket knives. It can sharpen straight blades, curved blades, re-curved blades, tanto blades and virtually any other shape of blade. You can purchase diamond belts separately, which are suitable for use with ceramic knives. The coarse belt is used to repair damaged blades and sharpen cutting tools. The medium belt is used for general knife sharpening. The fine belt is used to hone knives, sharpen serrations, and to do quick touch-ups on blades that have been recently sharpened. The sharpening guides give you fast, easy, consistent results, and are interchangeable so that you can create precise cutting angles. They are 40, 50 and 65-degrees, and designed for different uses, or they can be taken off to sharpen tools free-hand. Besides sharpening knives, this can also handle scissors, serrated knives, and cutting tools such as axes, hatchets, mower blades, garden shears and shovels. This is an ideal product for someone who wants it all from a sharpener – not just a kitchen knife sharpener. Replacement belts are available for purchase as well. 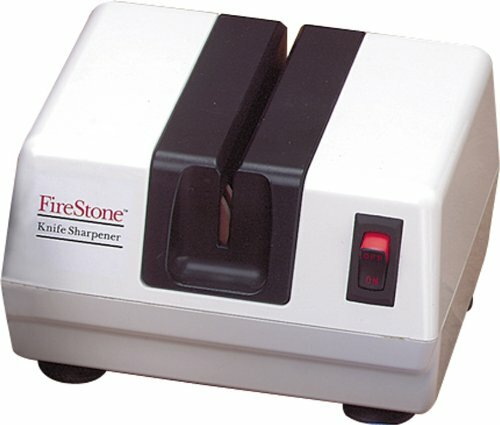 For great options to sharpen your knives, see our knife sharpener reviews which includes all types and stages.